One of my BFFs, Jan Brown, asked three unique questions; here they are with my responses. What's been the best and worst times femulating? I always say that "a bad day femulating is better than a good day not femulating." Honestly, I have not had many bad times femulating, but one occasion sticks out in mind. When I attended my very first support group meeting, it was my first encounter face-to-face with other transwomen and when I entered the meeting hall, all my overly critical eye could see was men in dresses. I was sickened by the sight because what I thought I saw was a reflection of myself, that is, a man in a dress and that is not what I wanted to be. I could not get out of Dodge fast enough. The best time occurred while I was doing outreach at a local university. After the class, a female student approached me. She said that when I entered the class, she thought I was a woman, not a transwoman, but a born woman. Thank you, I thought to myself, but then she added that besides thinking I was a born woman, I was also the most beautiful older adult woman that she had ever seen in person! I thanked her profusely as she examined my presentation real up close now. She thought I was about 45 years old and even up close she was very surprised when I revealed that I was 60. Then she told me something very personal that I will not repeat here. I thought I detected her eyes beginning to well up. Those few minutes with her were priceless to me and I will remember her forever. All those gals who are completely open about being trans. I am referring to the likes of Michael/Miqqi Gilbert and Grayson Perry, who are well-known in their respective fields as guys, but occasionally (or often) present as gals and damn the torpedoes. I want to be just like them when I grow up. What's on your femulating bucket list? Good post and with the ring of truth in it. My first "support group meet" was exactly like yours, Stana. I also left in a hurry and I didn't get the out-reach chance you got. Keep up the good works, I'll keep reading! Jan asked some great questions and I would like to see her responses and I would invite responses to her questions from your other readers. To keep the ball rolling I will give it a go. Best feeling was one time when I was going out on a Saturday night my wife loaned me a gold chain and a set of gold clip on earrings that she said would go good with my dress. This was a big step for her and gave me a great sense of affirmation. The worst was the fear I felt as I was pulled over by a cop after leaving Georgies down in Asbury. I had only had 2-3 wines and did not think I was speeding. He realized I was sober enough to drive but did give me a ticket for 11 mph over the limit. I was wearing a rather short coral lace dress so I had plenty of let showing as the cop shined his light into the car. Frankly Stana, Meg, Jan and others who have found a balanced blend between their traditional male lives and their desire to be an occasional woman are my heroes. I would like to find the freedom to dress how and when I wanted and have the freedom to go out and about while dressed. 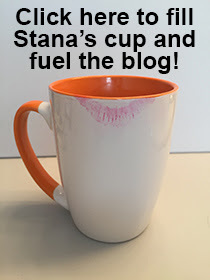 Again, Stana, thank you for allowing your blog to serve as a forum for Q&A, etc. Thank You for your answer to your new "Q & A" offer. I await your other answers, including those to some I posed (via comments to your first post inviting questions). You look absolutely lovely and oh so feminine in this photo. What a Woman!!! I can't believe your worst time was identical to mine... I was so put off by attending my first support group that I was not sure if I would ever go out in dress ever again. I thought I looked OK, but seeing the group at the hotel I felt like we all were guys in drag... I wanted to look like a woman. I have not gone back to the group, though I have been to other social environments with girls. My favorite times is when I am least noticed. Isn't it funny - I've been to a few support group meetings in different areas and hated each one. I had very similar feelings to you, and I realised that I somehow didn't particularly identify with those people and yet I was one of them!